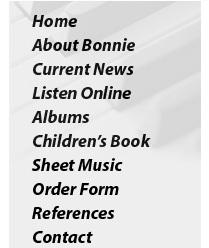 Below is a flash player that enables you to listen to MP3s from 3 of Bonnie Knopf's albums. They are, Close To His Heart, Heart of Worship, and Heart of Worship II. More MP3s will be added in the coming weeks. If you cannot see the player below, or are having difficulties hearing the music, then you might need to download the last flash plugin. Download it Here. Copyright 2006 Bonnie Knopf. All Rights Reserved.